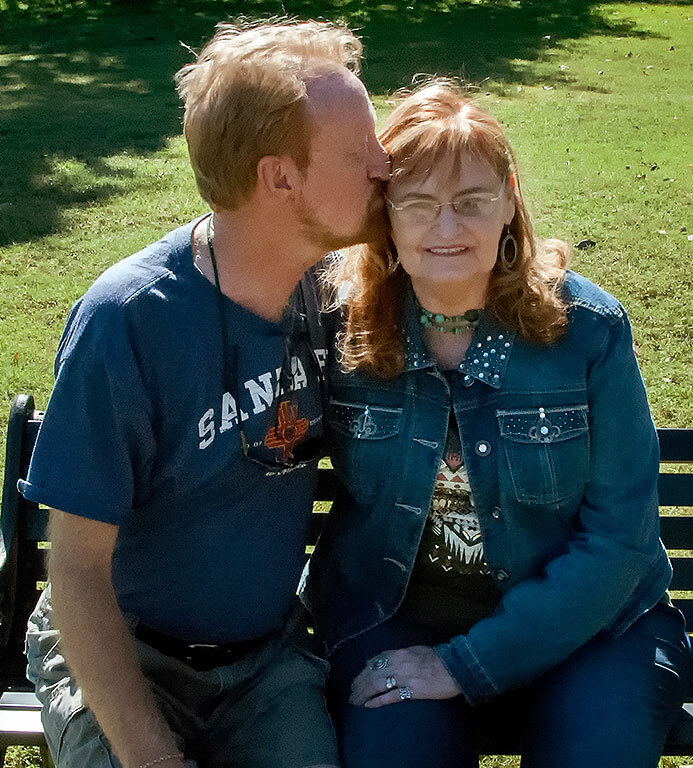 I give my wife Abby a kiss on the head as we pose for photos at her family’s reunion in Duncan, Oklahoma Sunday morning. I kiss her in this fashion all the time because her hair smells like sunshine. Most of us know that 13 is often regarded as a lucky number, or conversely, as a cursed number. Some people bet on 13 in gambling, for example, while some hotels don’t even have a 13th floor. 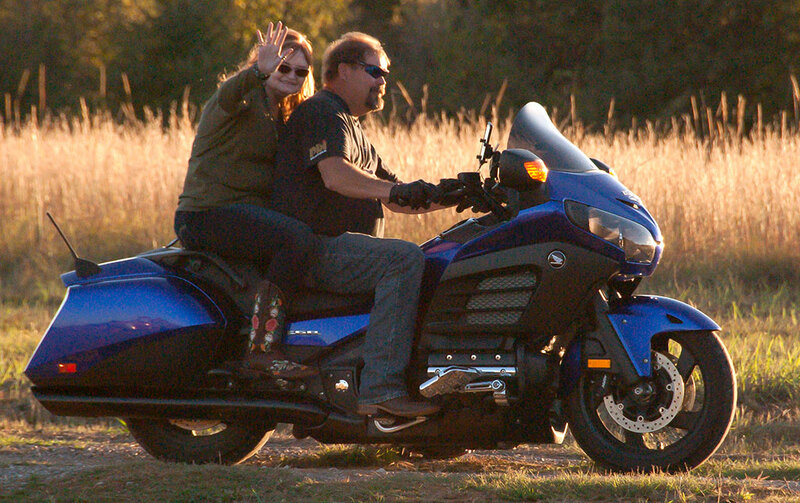 Abby rides on a motorcycle with her cousin Donald Lee Ashford at the family reunion Saturday night. Fear of the number 13 is triskaidekaphobia. I can’t speak for other grooms, but I found anticipating our wedding and exchanging vows with Abby as natural as anything I have ever done. I don’t consider any of this significant because, aside from an increase in 13-related mischief and mayhem as part of a feedback loop/self-fulfilling prophecy, there isn’t much about the number 13 that interests me. I thought about all of this as my wife Abby and I arrive at our 13th wedding anniversary October 12. 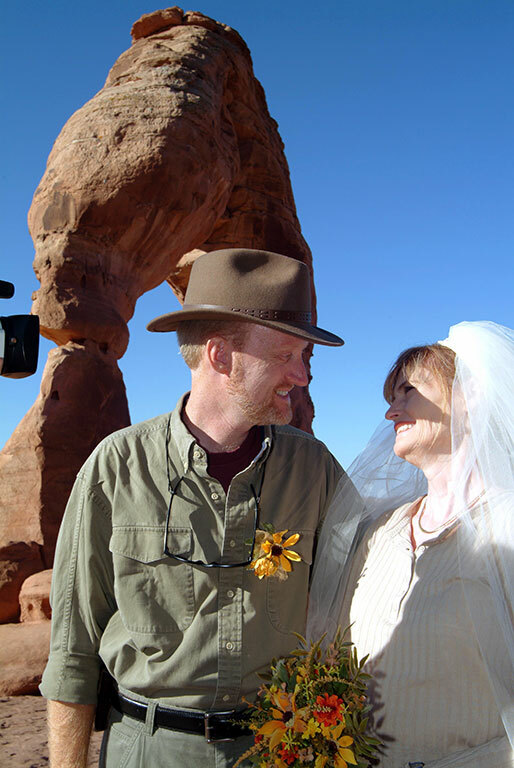 We exchanged vows in Utah’s iconic Delicate Arch in Arches Nation Park on a perfect morning in 2004. This entry’s title, “Worky Thirteen,” refers to the fact that luck represents about 13 percent of the success of a marriage, and the remaining 87 percent is work, patience, trust, intimacy, work, indecision, mistakes, laughter, tears, work, heartbreak, elation, connection, and work. I have never worked so hard at anything in my life, but I have never reaped more reward from anything in my life. 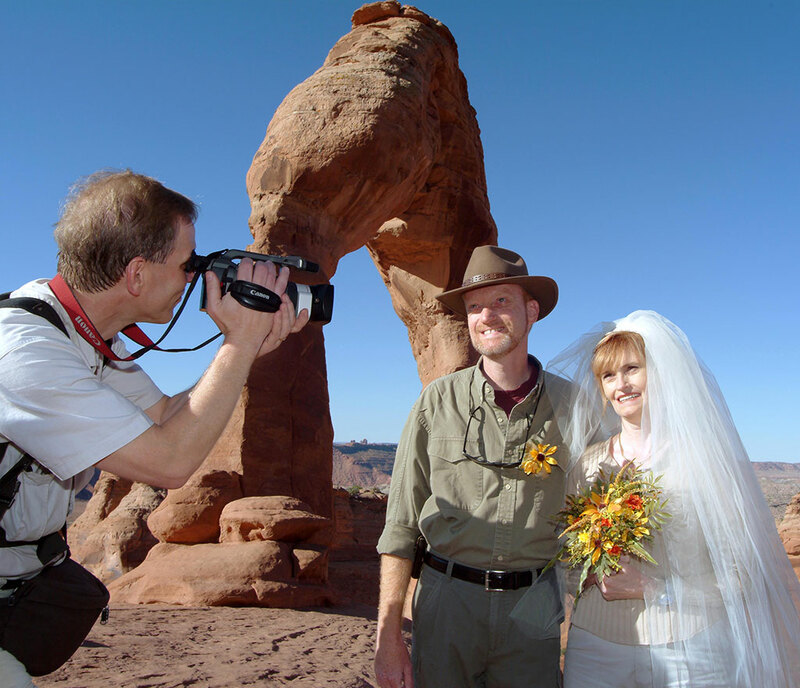 This is the quintessential wedding image from 13 years ago. It was, quite simply, a beautiful day in every respect. So glad the two of you found each other. Happy anniversary! I’ll always cherish the memory of your perfect wedding day. Thanks to you both for setting such a good example for marriage. Your big brother game is strong. One of my favorite numbers. 13 is the common number for family members on teams. There are 13 segments on turtle shells. 13 cycles of the moon. Now 13 years of Awesome being together. Well done Bro.